Such is the heightened expectation around Old Trafford, particularly in the wake of Saturday's scintillatingly old-style 3-2 win over Southampton, that suddenly anything seems possible. Including what would be a stunning comeback triumph in Wednesday's Champions League trip to Paris. Manchester United trail 2-0 from the first leg, will be without the suspended Paul Pogba and have a rash of injury concerns, but from a tie being widely written off in the aftermath of that defeat, United supporters are now daring to dream. Paris Saint-Germain were so superior three weeks ago that it seemed inconceivable that United could contemplate a turnaround. Now Ole Gunnar Solskjaer's bandwagon is gaining such momentum that his players head to the French capital quietly believing they could yet reach the last eight. Parallels are even being drawn with one of United's greatest European rescue acts, when, after a 1-1 home draw with Juventus, Alex Ferguson's men found themselves 2-0 down in Turin before rallying to win their 1999 semi-final 3-2. Of course, they went on to lift the trophy in Barcelona, when late goals from Teddy Sheringham and Solskjaer sank Bayern Munich. "We felt invincible," Solskjaer said. "We felt every game we were in with a chance to win - and the belief is here now." United's caretaker manager thinks United's grand tradition will help them in the Parc des Princes. "I have to say they are confident going into the game, knowing we are 2-0 down. We played them here and they are a good team," he said. "But we know what we are capable of. The players know they are part of a special club that can do something like this. We are not going to go there and lay down. We are going to give it a go." Solskjaer has masterminded a spectacular United recovery that has seen them take 32 points from a possible 36, move into the top four of the Premier League and reach the FA Cup quarter-finals. It may be early days but it feels increasingly like something approaching the United of old. There was certainly more than an echo of past powers as United completed a swashbuckling 3-2 victory on Saturday over a resilient Southampton side. Just as it appeared the relegation-threatened visitors were about to pocket a point, up stepped a revitalised Romelu Lukaku to drive in an 88th-minute winner. 'Fergie time' entered football parlance as Ferguson's side gathered in the silverware during his 27-season United reign, helped by innumerable grandstand finishes. Whether Solskjaer is given the opportunity to follow in those footsteps beyond this season remains to be seen but if the issue were to be settled by public acclamation, Old Trafford would surely rise to the Norwegian. The afternoon was also a personal triumph for Lukaku, who has so often looked short of confidence in the No 9 shirt. It was not just that he added a further two goals to the brace he dispatched at Crystal Palace in midweek, it was the composed, powerful manner in which he positioned himself each time before drilling past Southampton goalkeeper Angus Gunn. "He has responded fantastically to everyone who wants to criticise him because there is no one who practises finishing as much as he does," Solskjaer said. "His strengths are going toward goal, finishing, running in behind and of course, when we get him too deep in the pitch, maybe that doesn't suit him at times." Lukaku was the central contributor to an afternoon of sumptuous goals, launched when Yan Valery lashed home from 30 yards to give Southampton an interval lead. United were noticeably brisker after the break, with Andreas Pereira's piledriver flying past Gunn. 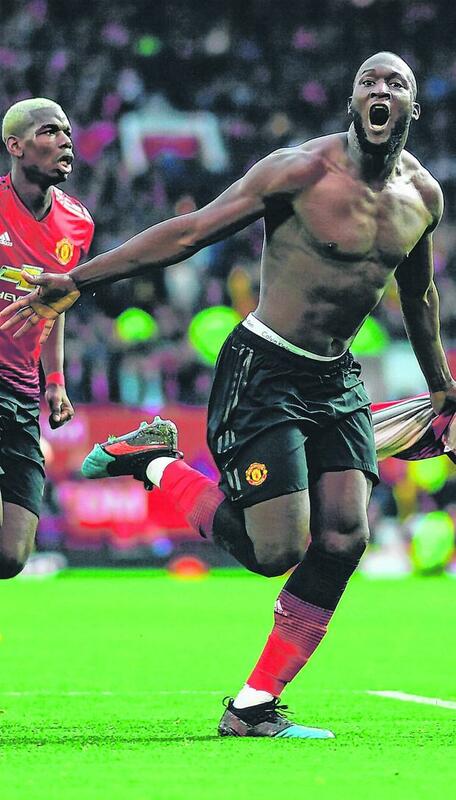 Lukaku looked every inch the vintage United forward, driving his side ahead soon afterwards. When James Ward-Prowse provided another picture-book goal, direct from a 75th-minute free-kick, the game suddenly swung wide open. It was, however, United and Lukaku's day and the big Belgian arrowed home from just inside the penalty area to spark frenzied celebrations in front of the Stretford End that even Gunn's blocking of Pogba's injury-time penalty did little to deflate.